Analytics India Magazine is back with its third edition of AIMinds – The Hub For AI Intellectuals. AIMinds is coming to Pune in collaboration with ZS. 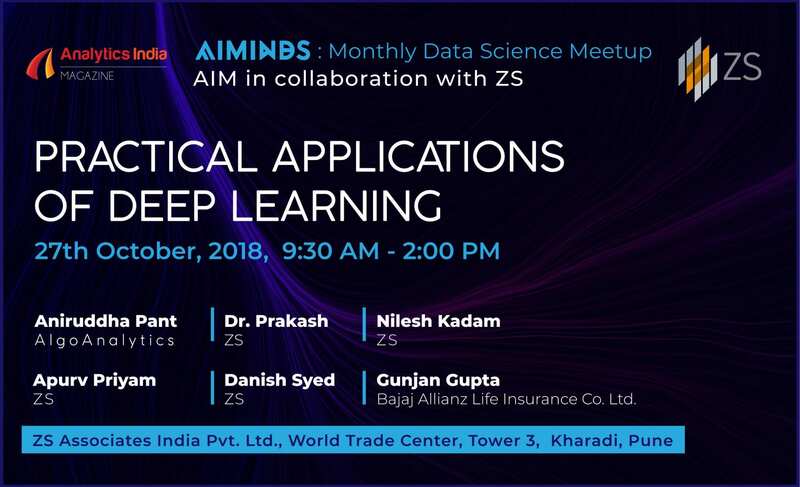 AIMinds is a monthly meetup which puts common public and data science enthusiasts in touch with artificial intelligence practitioners and researchers from all over the country. To register for free, click here and RSVP. Gunjan Gupta – Senior Vice President & Head – Analytics, Bajaj Allianz Life Insurance Co. Ltd. This initiative by Analytics India Magazine is a platform where established and aspiring minds in AI, data science and analytics can meet to have great conversations and share knowledge. Persons of all skill levels are welcome. The AIMinds meetup is established for aspiring minds in AI, data science and analytics. The participants will meet to have great conversations and share knowledge. Persons of all skill levels are welcome. It will be great if attendees come with loads of questions and an open mind. The speakers will be happy to take questions. Since When Did AI Become Such A Roadblock For Enterprises?